DENVER, Jan. 30, 2019 /PRNewswire/ — BTS supergroup’s mega-hit “BTS WORLD TOUR LOVE YOURSELF IN SEOUL” tour event grossed over $2.8 million at the domestic box office on Saturday, January 26, in over 1000 movie theaters nationwide; making this event the highest one-day gross for a music event for Fathom and for the event cinema industry in North America. The event was No. 5 at the box office and had the highest per screen average. 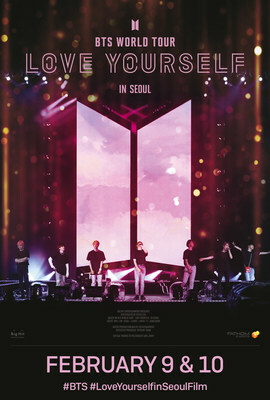 Pathé Live is the worldwide distributor of BTS concert film “BTS WORLD TOUR LOVE YOURSELF IN SEOUL“. Pathé Live, a fully owned subsidiary of the Pathé Gaumont cinemas is a market leader in the global distribution of event cinema. Our Events in cinemas are distributed live in HD with 5.1 Dolby sound via satellite broadcast or recorded in 2K, 3D or 4K. Pathé Live has released since its inception over 200 Events in cinemas. It is the exclusive producer and the worldwide distributor of the Bolshoi Ballet’s and la Comédie-Française’s cinema series to over 1,700 cinemas across 70 countries.